Choosing any supplement can be daunting but when it comes to turmeric and curcumin, there seem to be endless choices. We’ve narrowed them down to the best in several categories. The world of supplements is constantly changing and what was the best curcumin supplement four years ago may not be the best in 2017. So without further ado, here are our picks for the best turmeric supplements of 2017 as well as information on what to look for in your supplement and how different ingredients boost the body’s absorption of curcumin. When taken on its own, curcumin is poorly absorbed by the body. Therefore, how you take it and what you take it with is very important. Research has found that curcumin is better absorbed by the body when taken with piperine (an active component in black pepper). In fact, one study found that piperine boosts the body’s absorption of curcumin by 2000%. That’s a huge difference! When cooking with turmeric, add a bit of black pepper to increase absorption. Most curry recipes contain black pepper. Just a pinch is enough to do the trick. In fact, black pepper will help you to increase the absorption of all of your nutrients, not just curcumin. Many of the best curcumin supplements you can buy contain piperine in the form of BioPerine, a black pepper formula that has been extensively studied and proven to increase the absorption of curcumin. 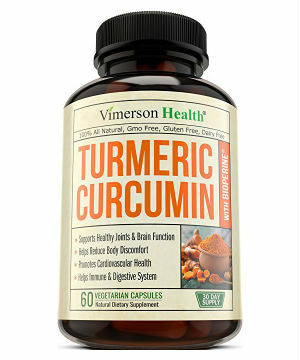 One of the best curcumin supplements with BioPerine is Vimerson Turmeric Curcumin with Bioperine. It’s a great option that is made in the USA and GMO free. 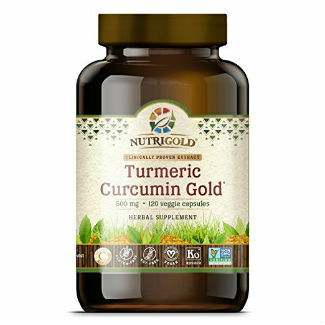 Another great option, Nutrigold Turmeric Curcumin Gold is one of the best turmeric supplements on the market and for good reason. It contains BioPerine, is Non-GMO Project verified, and is tested by independent, third party lab tests to meet the potency claims on the label. It contains the curcumin extract that has been the most clinically studies and includes the three major curcuminoids that are believed to have the most health benefits – curcumin, demethoxycurcumin, and bis-demethoxycurcumin. It is vegan, kosher, and independently certified to be free of common allergens like corn, gluten, eggs, peanuts, milk, shellfish, and soy. It is also free of additives or preservatives like magnesium stearate. 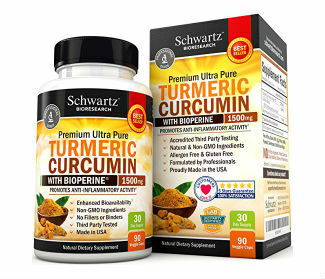 Schwartz Turmeric Curcumin with Bioperine is another very good choice containing BioPerine. It is made in the USA, contains no magnesium stearate, fillers, binders, or preservatives. They are also free of all common allergens and are suitable for vegans and vegetarians. 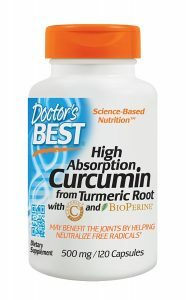 One more option with BioPerine is Doctor’s Best Curcumin w/ Bioperine . It gets rave reviews on Amazon by people who say it has improved their health dramatically. However, it’s last on my list of turmeric supplements with BioPerine because Doctor’s Best was sold to a Chinese company and is not manufactured in the USA. If this doesn’t matter to you, you might want to check out the reviews and decide for yourself. Fat eaten at the same time also helps your body to absorb more curcumin. Some experts recommend taking a turmeric supplement that is suspended in olive oil. 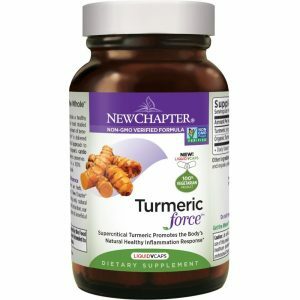 New Chapter Turmeric Force comes in capsules containing olive oil. Although this brand does not contain black pepper, the company claims that it isn’t necessary because of their whole plant formulation that contains hundreds of compounds including tumerones. Most other turmeric supplements contain isolated curcumin instead of the whole plant. You can always take a little bit of black pepper when you take these if you like the concept of a whole plant formula but don’t want to miss out on the benefits of black pepper helping with absorption. Administering turmeric with a liposomal formula may help to increase absorption. One study found that liposomal turmeric resulted in a 42% pancreatic tumor growth suppression in mice. The great thing about liposomal supplements is that you don’t have to take a pill. 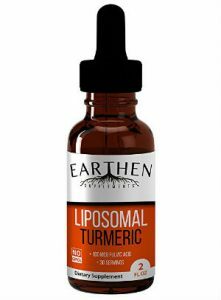 I like Earthen Organic Liposomal Turmeric Liquid Extract. It also contains fulvic acid which helps to improve absorption of curcumin and provides trace minerals and cell hydration. It is made in the USA of 100% non-GMO ingredients and contains nothing artificial – no fillers, artificial preservatives, or heavy metals. Another liposomal option is PuraThrive Liposomal Turmeric. 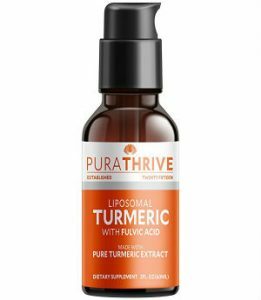 Like the Earthen Liposomal Turmeric, PuraThrive also contains fulvic acid. It is made in the USA and each batch is tested for heavy metals, purity, and potency. We hope this has helped you to pick a turmeric supplement that works for you. If you’ve tried any of these let us and our readers know in the comments below! We’re also looking for first-person stories on ways that turmeric has improved your health so drop us a line via the contact page if you have a story to share.